The following quick post was prompted by my reading of Christian vs Islamic Art: Flesh vs Word - by Prof. Monica Bowen at Albertis Window (link). The open access reference included below addresses another, lesser known example of a visual similarity between Islamic and Christian art - in this case the use of ornamental egg-shaped objects suspended within sacred buildings. The interpretation of symbols in their art historical context, known as iconography can be a challenging field of study. In examining the symbols used by artists, the viewer must aim to understand the context in which these images are used, and how these objects relate to the patron, the scene depicted and the intended location of the work. 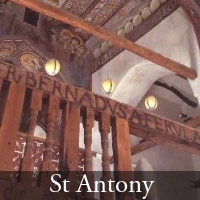 Certain symbols are more commonly encountered, such as the attribute of a saint, often continuing a tradition of depiction that can be traced back into early Christian art, or beyond into antiquity. Others symbols are more esoteric, placed as markers to denote a specific patron or event. Some of these are more easily identifiable, such as a coat of arms or symbolic animal, whereas others continue to elude scholars. One such enduring mystery is the egg suspended from the ceiling in Piero della Francesca's Montefeltro Altarpiece. A cursory analysis may state that the egg is well known symbol of fertility and birth - a suitable motif for a painting featuring the Christ child. Other readings see this object as a large pearl, which along with the shell represented in the architectural features behind may represent the purity of the Virgin. However, a look at the history of the use of eggs suspended in Churches pre-dates the Renaissance, and can also be seen in Islamic images. Those curious to learn more are encouraged to read the wonderful open access article by Sebastian Bock - hosted by the University of Heidelberg Library digital archive. It provides an overview of the range of interpretations offered for this work, and includes Bock's own analysis, tempered by his familiarity with the use of ostrich eggs in a medieval context. See sources below for relevant links. I am particularly interested in learning more about the use of these eggs within an Islamic context and welcome any references or links readers may offer. Please leave comments below. Please see comments below for some fascinating links and resources. The fabulous overview posted at Japanese Mythology and Foklore is also highly recommended (link). The ostrich egg as a symbolic object seems to have an amazingly deep history, with markings being found on eggs from 60,000 years ago. Many thanks to all the commenters, and particularly to Sedef Piker and Karen Barrett-Wilt for providing further detail on these eggs in an Islamic context. The following image is from Edirne Mosque in Turkey, showing an ostrich egg above a light fixture. Hanging eggs, Cosmic Egg myths and excavated ostrich eggs across Near East, Old Europe and Eurasia. Posted at Japanese Mythology and Folklore. (link) Very useful post compiling many sources exploring the appearance of the ostrich egg across the art and archaeology of several cultures. Fascinating! The placement of an ostrich egg on the top of towers of African mud mosques (such as at Djenne in Mali) immediately came to mind. If my memory is correct, they were placed there to symbolize purity and/or fertility, but I think that there are hypotheses that there was a more functional aspect to it - maybe the eggs helped protect the top of the mud towers from rain? Looking forward to hearing about the info that you gather! I have some things from Islamic art and culture for you. Gulru Necipoglu, in her book "The Age of Sinan: Architectural Culture in the Ottoman Empire" mentions ostrich eggs in regards to the Suleymaniye, Edirne and Sinan Pasha mosques. The only remaining examples with silk tassels being in the Mausoleum of Suleiman the magnificent today. 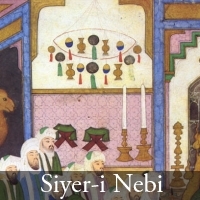 "Inside the Selimiye, Reinhold Lubenau (1587-88) saw five thousand oil lamps and 'spherical mirrors resembling globes of damaschined iron' in addition to ostrich eggs hanging from large iron rings." There are other travelers' accounts that mention the ostrich eggs as well but I have not come across any explanations. If I can make an educated guess here, I can think of two reasons in regards to religion. Ostrich eggs are a spider repellent (this is such common knowledge that authors may not feel a need to clarify this detail) and spiders are sacred in Islam because a spider saved Mohammad's life. As a matter of fact, the modern mosques in Istanbul also have ostrich eggs. My second reasoning would be that all the decorative elements in Islamic art are based on a circular motion which represents the universe. Especially when you look up the light fixtures and various shiny balls or ostrich eggs are reminiscent of the solar system. If we take the traditional argument that these eggs were actually pearls, then there are the Byzantine influenced mosaics of the Friday Mosque Damascus with hanging pearls in the doorways. This is all I can think of for now but I will let you know if anything else comes us. In the Bellini and Carpaccio images, the elaborate hanging device looks like the sanctuary lamp still found always lit in Catholic churches today. Alternatively, they could also be receptacles for unused or reserved hosts used at Mass. IN the Middle Ages churches did not have the common tabernacles for the hosts still used today. The original Catholic encyclopedia (1910) describes one of the methods used to house the reserved hosts. "In a dove or pyx, surrounded by a cover or receptacle, and generally surmounted by a small baldachino which hung over the altar by a chain or cord." 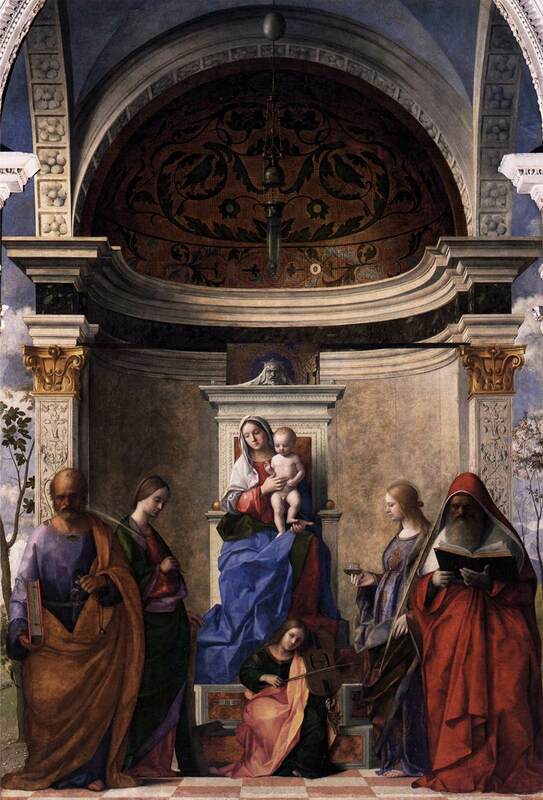 Perhaps Piero provided a stylized version of this in his famous altarpiece. The Easter egg was regarded as the tomb that held the body of Christ that would emerge on Easter sunday. It would appear that Piero has not painted a Nativity but a Pieta and that the sacrificed Christ lies on his Mother's lap. The egg tomb symbolism would then fit. Also, the fact that the egg is hanging from a clamshell reminds one of Botticelli. Thanks for the Bock article. I agree with him that much of the beliefs and traditions of that long ago era have been lost to us. Art is one of the few windows into that world. 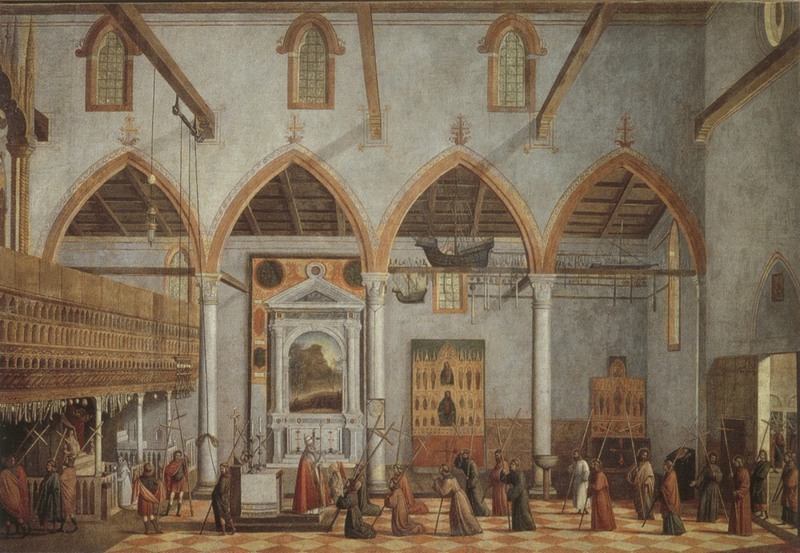 He did mention the strange objects hanging in the Carpaccio but they wouldn't be so strange to anyone visiting a church in Italy even today. You can't believe the things that people put up on church walls when their prayers have been answered. 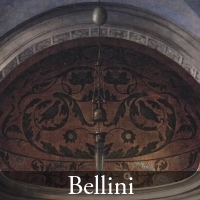 If you remove the figures in the Bellini and the Piero paintings, can you see in the reliefs and coverings work that would make any Islamic artist proud? This is a fascinating connection! The comments here are equally fascinating. I especially am intrigued by Sedef's connection between ostrich eggs and spiders. 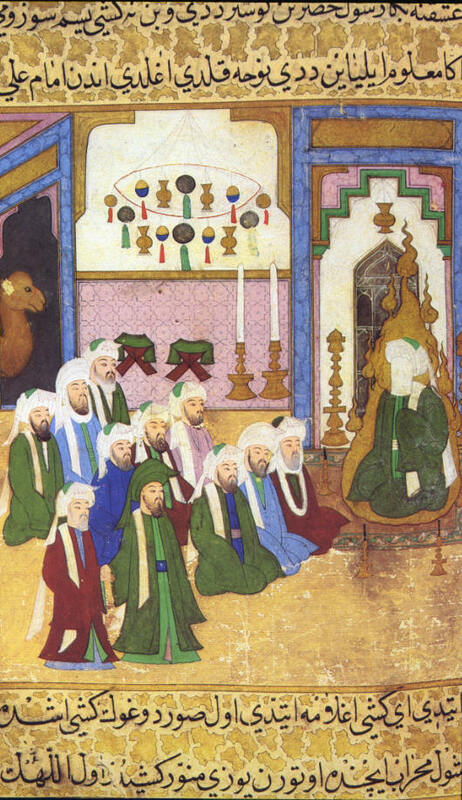 I don't know much about the Islamic connections with the egg, but I have read a little more about the use of the egg in the Renaissance. 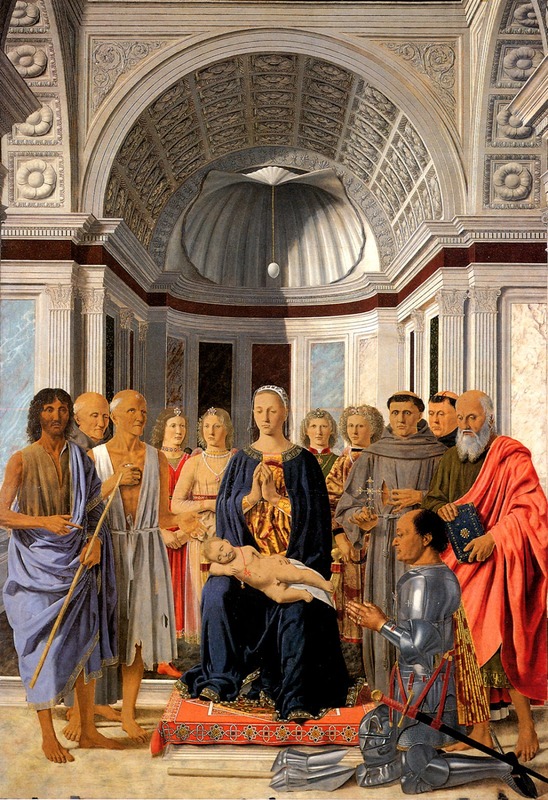 This Piero della Francesca painting, "Madonna and Child with Saints and Federico da Montefeltro" (c. 1472-74) is located on the cover of feminist Mary D. Garrard's relatively new book, "Brunelleschi's Egg." 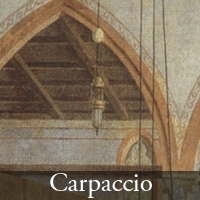 Garrard writes, "The egg that hands in dramatic suspension at the compositional heart of Piero della Francesca's Brera "Madonna" alludes, as Millard Meiss has shown, to the custom in fifteenth-century Italy to hang eggs within churches. In the Florentine Duomo, a large marble egg hung over the high altar (which was dedicated to the Virgin), and two such eggs hung over the high altar of Siena Cathedral. Through folk tradition, eggs maintained a residual association with fertility in general, and in juxtaposition with the Virgin Mary, the egg expresses the key Christian concepts of the miraculous virgin birth and Christ's miraculous resurrection. The egg's Christianized symbolism always points to Christ, the prized end-product. Yet in both Pietro's painting and in real-life Quattrocento practice, it stubbornly retains its pre-Christian meaning: suspended within a domed Marian church, the egg more naturally symbolizes the Virgin herself and invokes by its shape the larger fertility reference in the breast-formed dome above" (Garrard, p. 45). Thanks for sharing! I'll be sure to include a link to this post on my own post. I did feel that there was *much* more to this topic of symbolic uses of ostrich eggs, which is why I refrained from a longer form post here. Having even a cursory look at the wide range of history these objects appear in is fascinating. 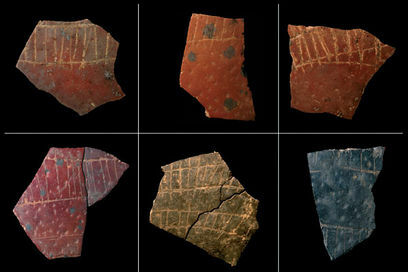 For those interested in reading a little more - this re-posted article from the Fortean Times provides an insight into the use of ostrich eggs since prehistory - including 60,000 year old ostrich eggs bearing engraved patterns, described by some as the "the birth of symbolic thought"
@Frank/Alberti's window - the Christian uses of these objects seem to also have an interesting variance - from a functional one as Frank has mentioned to more symbolic uses as outline in the Bock and Garrard articles. The great John Shearman once wrote that the study of these eggs (prompted by Piero's famous example) produced enough literature to constitute its own branch of art history. Looking at a the evidence stretching back 60,000 years - I'm inclined to agree. Dr Necipoglu says that the tradition of the ostrich egg goes back to the Umayyads in Damascus, as a matter of fact some can be seen in the Great Mosque mosaics. She also mentioned Barry Flood's book "The Great Mosque of Damascus..." which has some information in regards to the Ostrich eggs going back to the Byzantines - http://books.google.com/books?id=r5f8kxIyykQC&printsec=frontcover&source=gbs_ge_summary_r&cad=0#v=onepage&q=ostrich%20egg&f=false -Really fascinating. Thanks for this invigorating post Hasan.